"It did affect me to find out that I was at risk for diabetes, which I had no family history of. But my family has all been extremely lean and I was not so lean, as I discovered when I got this information," Collins says. The "wake-up call" led Collins to switch up his diet and start an exercise program. His efforts helped him drop 25 pounds. 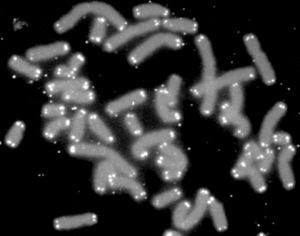 Human chromosomes (grey) capped by telomeres (white). Image source: Wikipedia, public domain. Francis Collins: DNA May Be A Doctor's Best Friend - Shots - NPR Health News. THAT IS GOOD TO KNOW THAT NOT EVERYONE IS LEAN TOO DIABETES THANKS TO DNA AND MOLECULAR BIOLOGY.